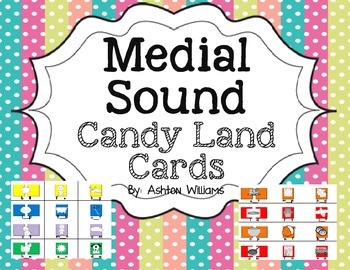 This download contains Medial Sound Candy Land cards. All you need to add is the board and some game pieces. 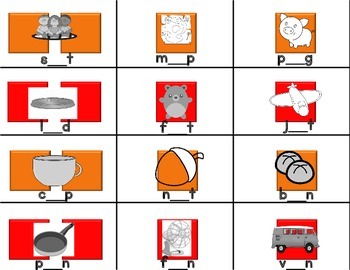 It's a great way for students to practice identifying the middle sounds in common CVC words. 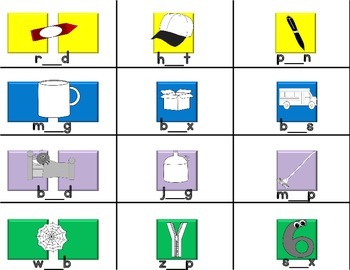 Each card features a common CVC word with a matching picture on it and the beginning and ending letter. The middle letter is missing from the word and students have to figure out what vowel goes in the spot to make the word complete. There are 48 playing cards total. Students pick a card, say the item pictured and then say the vowel that is missing from the word before they move their game piece. This is a great small group activity and is great for centers. It's a fun group activity that has students practicing a vital skill.